It was an unfortunate race for Kornfeil who lost victory in the last lap. Jakub Kornfeil was dominating during the 2016 MotoSurf WorldCup weekend. He won the qualifying, took victory in all the heats and controlled the first race. Lukáš Záhorský finished behind him and home rider Jan Charouz came third. Second race went quite the same and Kornfeil opened a very comfortable leading gap. Unfortunately, the Czech rider crashed behind a lapper Jan Van?ura in a very last lap of the race and Lukáš Záhorský got a chance to take the lead. However, Jakub got back to his board very quickly and continued the race in the first position. It seemed he stabilized the situation and would win the second round as well. Unfortunately, turbine on his craft sucked some dirt from Vltava River, slowed down and Kornfeil was relegated down to seventh. 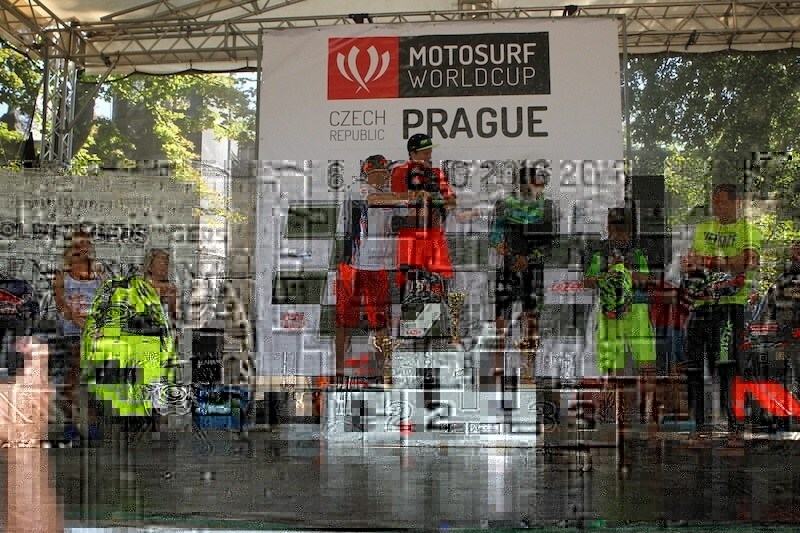 Lukáš Záhorský won from Jan Charouz and Slovakian youngster Sebastian Kubinec who grabbed his first ever MotoSurf World Cup Final A third place. Jetsurf founder Martin Šula finished fourth and top five was completed by Michal Loš?ák. Second and first positions mean victory for Lukáš Záhorský and a second consecutive victory this season. Jan Charouz from Prague Jetsurf Club steped up to second spot and a bad lucker Jakub Kornfeil remained on the last podium spot. Sebastian Kubinec left Prague with excellent 4th and Martin Šula scored important points for the Championship in fifth. Jetsurf Factory rider Aneta Šacherová confirmed her amazing pace from Slovakia and dominated the Prague’s race with two first places. Aneta opened a comfortable gap in both races and scored second consecutive double victory. Second lady of the World standings Ale Rivas experienced an unlucky weekend. Mexican rider finished in solid 2nd in the first race but a technical fault prevented her of riding the board she is used to in the second heat. Only 8th place finish in the second round put her to 4th place overally. Consistent Martina Bravencová from Prague Jetsurf Club scored 4th and 2nd place finish for second place overally. What a nice performance from the local club rider. Kristýna Šev?íková takes a premiere podium finish of hers – two consistent races with two third positions gave eventual third. The next round of the MotoSurf WorldCup takes place in Amsterdam, Holland in one week time.